Preparing incendiary kites at a location east of Gaza City (Palinfo Twitter account, May 4, 2018). 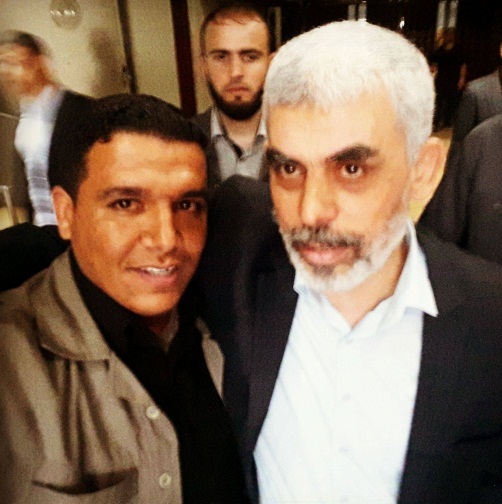 Iyad Abu Musheir with Yahya al-Sinwar (Facebook page of Iyad Abu Musheir, May 9, 2018). 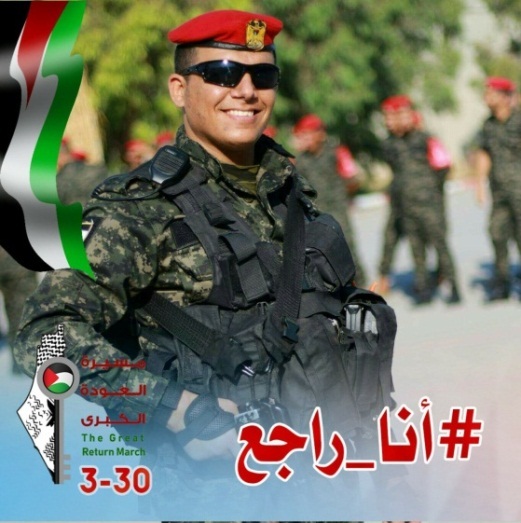 Iyad Abu Musheir in the uniform of Hamas' military police with "#I_return" (Facebook page of Iyad Abu Musheir, March 29, 2018). The "I return" hashtag is used by many "return march" activists. Hamas cartoon. The Arabic reads, "[In spite of] the Israeli attacks on Gaza... we continue" (Felesteen, June 22, 2018). Arson terrorism is a modus operandi that began as a local initiative during the third week of the “return marches.” Since then it has become more sophisticated and extensive, and has turned into Hamas’ preferred modus operandi in the policy of controlled violence implemented against Israel during the past three months. Arson terrorism has become popular because the Gazans became tired of the marches. 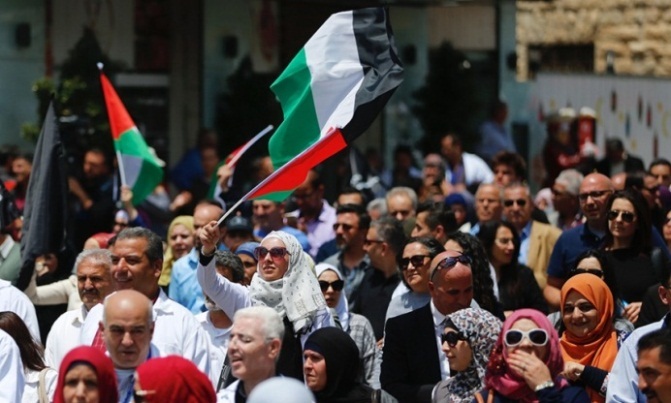 At the same time, Hamas is aware of the damage to fields and forests and the disruption of daily life in the Israeli communities in the western Negev. In addition, the kites and balloons are cheap, easily available and effective, and the danger to the Palestinians launching them is relatively low compared with other types of attacks (such as rocket and mortar shell fire or penetrating into Israeli territory). 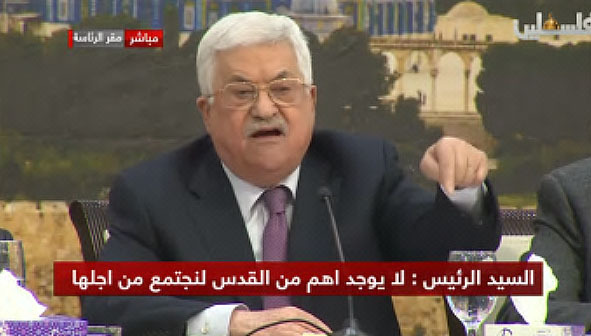 Therefore, Hamas took control of launching incendiary and explosive kites and balloons and publicly promised to protect the Palestinians engaged in launching them. Hamas implemented its public promise with a new “rule of engagement on the ground:” rocket and mortar shell fire as a response to what Hamas views as an exaggerated Israeli reaction to the launching of kites and balloons. 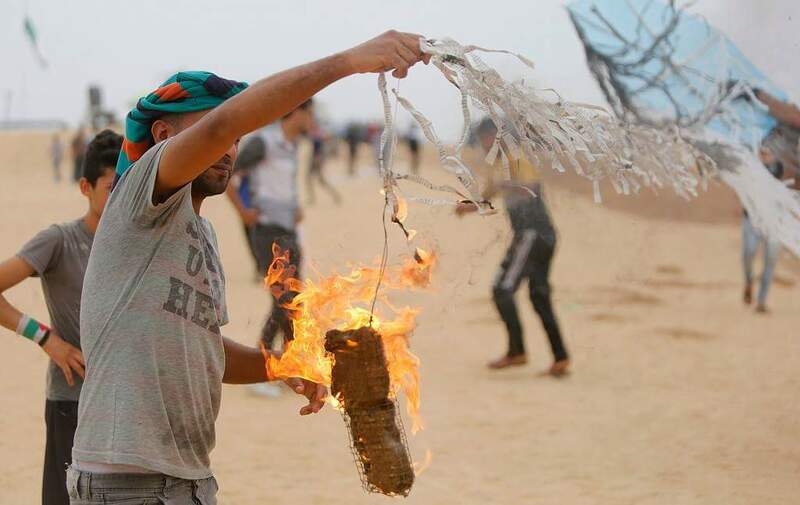 Hamas has accompanied arson terrorism with a propaganda campaign stressing the damage the fires cause Israel and noting that launching kites and balloons will continue. In practice, Hamas’ military wing prepares and launches kites and balloons (and also handles Palestinian youth in carrying out arson terrorism). The intensive involvement of Hamas operatives is manifested in several ways: they serially manufacture and prepare kites and balloons; Hamas transports them to launching sites, sometimes in military vehicles; Hamas operatives participate in the launchings; and the launchings are centrally scheduled and orchestrated (dozens of kites and balloons are launched at the same time for the greatest physical and propaganda effect). In some instances balloons are launched from Hamas observation sites and posts near the border (despite the risk of Israeli retaliation). Launching incendiary balloons from a Hamas observation post near the security fence (IDF spokesman’s website, June 24, 2018). The IDF spokesman recently issued information and a video exposing the central role of Hamas in arson terrorism. It showed arson terrorism is an organized, scheduled modus operandi undertaken by Hamas, and that its military operatives participate in it (some of whose names and pictures were published by the IDF spokesman). Most of the incendiary kites and especially the incendiary balloons are launched on the orders of Hamas operatives. A considerable number of incendiary balloons are launched from Hamas observation posts near the Israeli border. According to information published by the IDF spokesman, the hierarchy of arson terrorism headed by the sector commander of Hamas military wing, who decides when incendiary kites and balloons will be launched into Israel. He instructs operatives to manufacture and prepare them. Most of the time, they are manufactured serially and in quantity. Once they are ready they are distributed and launched into Israeli territory. 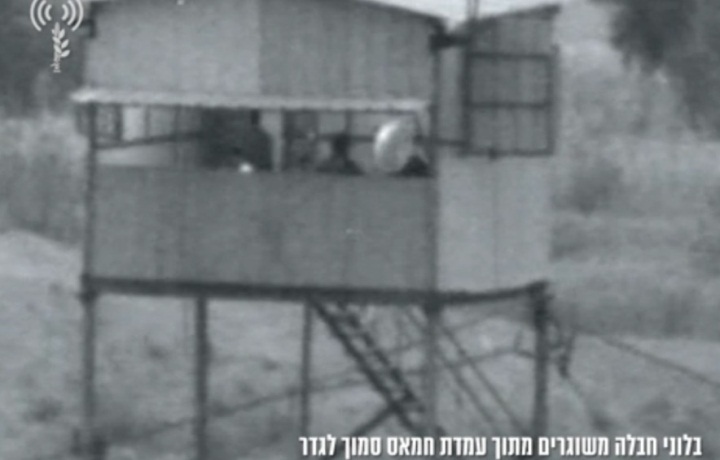 Some of them are launched from Hamas military wing observation posts located near the border. Hamas military operatives participate actively in launching the kites and balloons. 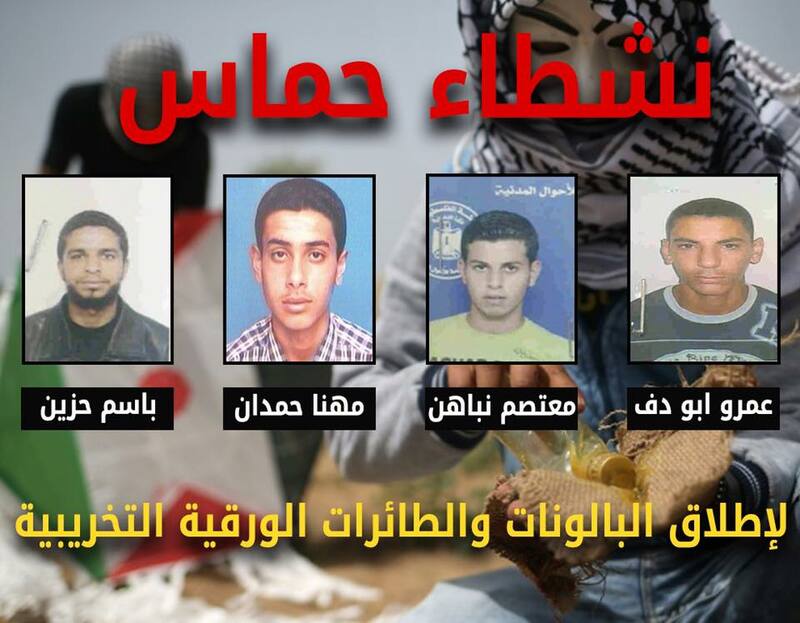 The IDF spokesman published the names and pictures of four Hamas operatives involved in the launchings: Bassem Hatem Abd Hazin, Muhana Ibrahim Abd Hamdan, Mu’tassem Fathi Atia Nabhan and Amru Hussein Muhammad Abu Daf. Hamas operatives involved in launching incendiary kites and balloons: left to right, Bassem Hazin, Muhana Hamdan, Mu’tassem Nabhan and Amru Abu Daf (IDF Facebook page for the Arabic media, June 24, 2018). Hamas does not usually publicize the involvement of its operatives in arson terrorism. However the ITIC analysis of a Facebook page revealed information about an exceptional case, that of Iyad Muhammad al-Baz Abu Musheir. He is an operative in Hamas’ military police and involved in the activities of the Hamas-affiliated “al-Zouari unit” which “specializes” in launching incendiary and explosive kites and balloons (named for aeronautical engineer Muhammad al-Zouari, who developed drones for Hamas and was killed in Tunisia). 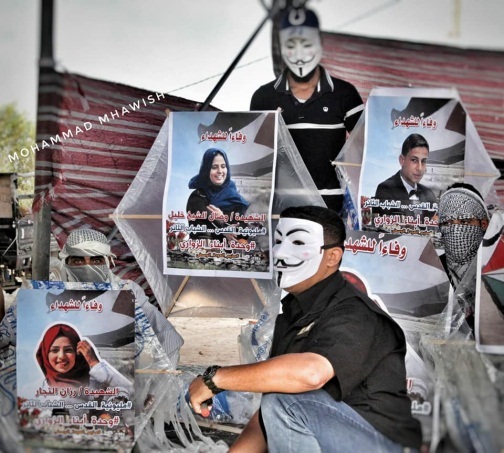 On June 10, 2018, Abu Musheir changed his profile picture to one of a masked operative launching kites. He is apparently the operative in the picture. 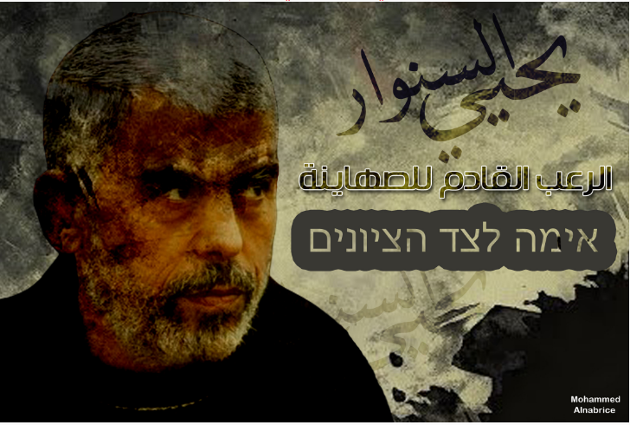 Launching kites: Profile picture of the Facebook page of Iyad Muhammad al-Baz Abu Musheir. The Hamas media have accompanied the launching of incendiary kites and balloons with a propaganda campaign which includes pictures and videos boasting of the damage done to Israel. The Hamas media reiterate that Hamas is protecting the Palestinians launching kites and respond to Israeli attacks with rocket fire (“an attack [in return] for an attack, blood [in return] for blood”). 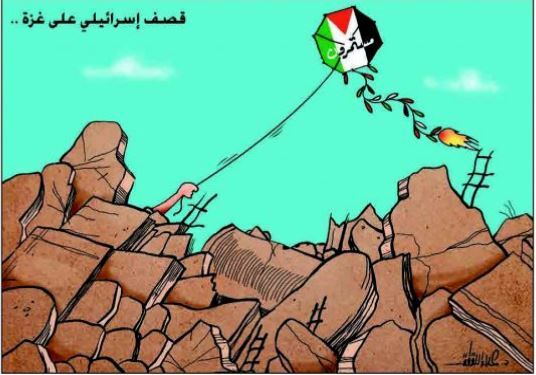 Hamas also notes that incendiary kites will continue to be launched despite the damage done by IDF attacks. 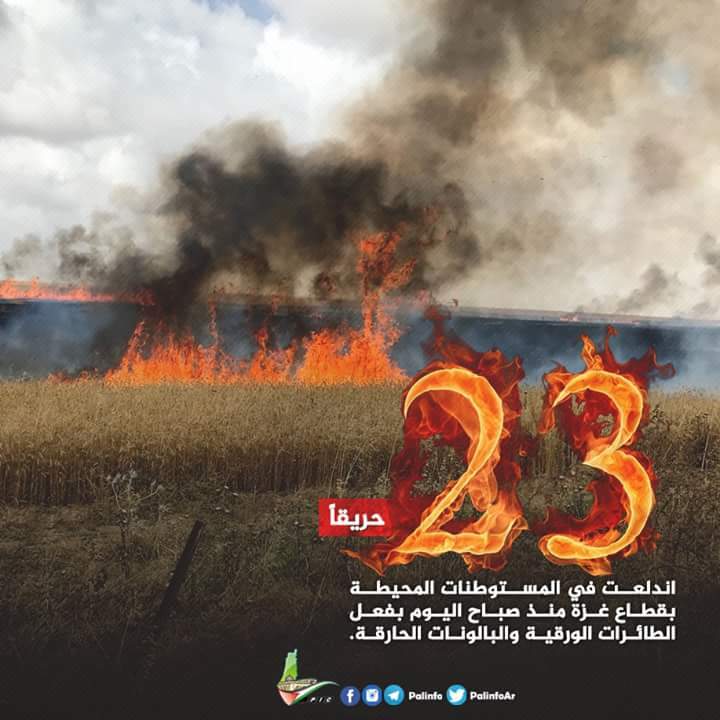 Right: Notice posted by Hamas boasting about the fires that broke out on June 27, 2018, caused by incendiary kites and balloons. The Arabic reads, “23 fires have broken out in the [Israeli] communities near Gaza since this morning [June 27, 2018], caused by incendiary kites and balloons (Palinfo Twitter account, June 28, 2018). Left: Hamas boasts of the fires caused by incendiary kites and balloons on June 16, 2018. 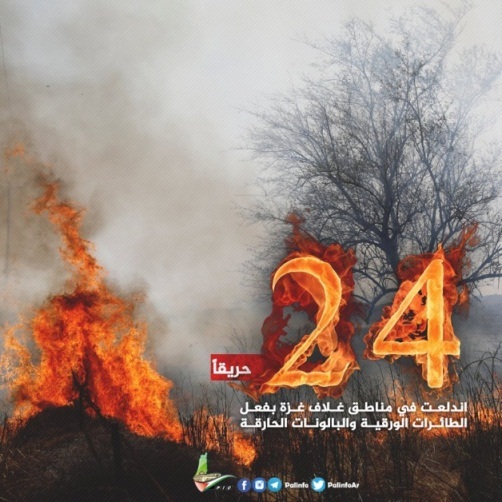 The Arabic reads, “24 fires near Gaza caused by incendiary kites and balloons” (IDF spokesman, June 27, 2018). Notice in Hebrew posted jointly by the military wings of Hamas and the PIJ. It reads, “an attack [in return] for an attack and blood [in return] for blood” (Twitter account of Adham al-Salmiya, June 20, 2018).